Rice flakes sweet polao is very easy to make. 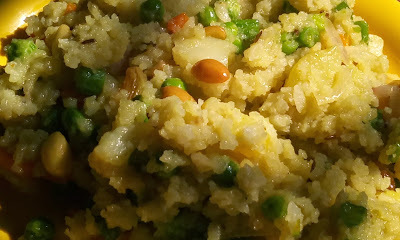 This tasty bhog recipe can be made in a jiffy and leaves us relaxed on Basanta Panchami Saraswati puja day and always makes an ever lasting impression in whom you offer. If you want to spread your love among those chirping sparrows [friends of my kids] during their short visits on Saraswati puja day who are always in a hurry this on should blow them off their feet in a storm of flavours. Wash rice flakes once and drain the water. Take water in a big bowl. Now take washed flakes on a colander and dip into the bowl water and remove quickly. Keep washed rice flakes in the colander to drain all the excess water and leave to dry for 10 minutes. Now mix salt, sugar, turmeric and clarified butter with the washed rice flakes. Take a pan, heat oil, add cracked whole spices, add green peas and raisin mix well, now add bay leaves and whole red chili. Now add peanuts and potatoes, mix well. Add green chili and ginger and fry a little. Add washed and seasoned flattened rice in a small batches, stir and mix carefully. Now add grated khoa kheer, mix and put off the fire. Leave for 5 minutes and offer.